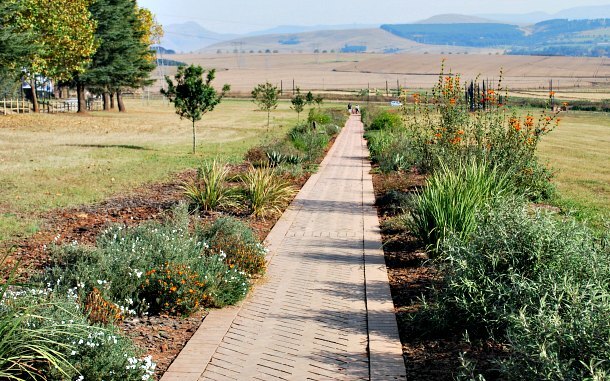 The Nelson Mandela Capture Site is a visitor attraction located along a quiet road where Nelson Mandela was captured in 1962 whilst on the run from the authorities. The visitor’s centre here includes an exhibition, cafe and an attractive walkway down to the roadside where you’ll find an amazing sculpture. 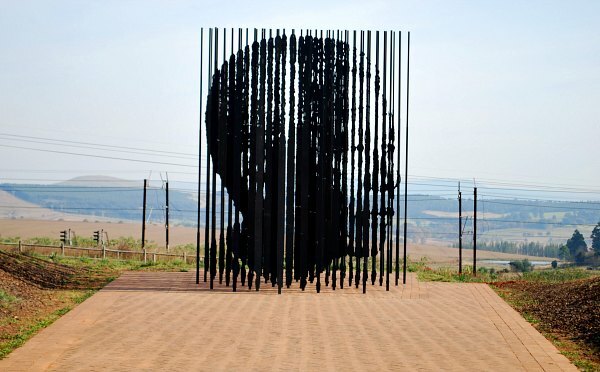 What looks at first like strips of irregular shaped steel pointing skywards, slowly comes together, as you get closer, to form an image of Nelson Mandela’s face. For this reason, and because of the significance of this site, our visit here was one of our most memorable moments of our trip. 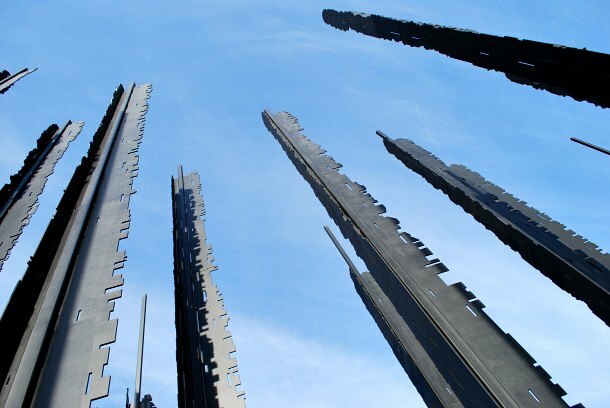 The sculpture is made up of 50 steel columns, some up to 10 metres tall and the perfect viewing distance is around 35 metres. At this point there is a marked paving area, so you know where to stand to get the best view. Move only a little way in any direction and the image of Mandela starts to disappear. The artist, Marco Cianfanelli, points out that this symbology is a key part of the capture site because after Nelson Mandela was caught, he disappeared for 27 years whilst being held in various prisons, most notably Robben Island near Cape Town. The landscaping and the sculpture here do overshadow the temporary barn-like structure which houses the exhibition about Nelson Mandela’s life and capture. Don’t be put off though by its appearance from the outside because the exhibition inside is actually very informative. It’s a little confusing in terms of the time-line and you’re not always sure which information board to go to next, but it’s well laid out and includes large pictures, and some audio visual exhibits too. Obviously there’s lots of information about the capture when Mandela was actually pretending to be a chauffeur to avoid detection, but you’ll also read about his entire life history here from his childhood to his time as president. 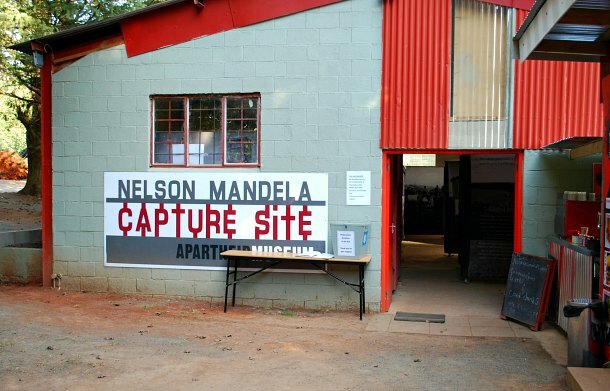 Nelson Mandela Capture site is open from Monday to Sunday from 9am to 4pm. Adult admission is 25 Rand (2014 prices) and there is a cafe on site. It will take you an hour or so to drive here from Durban, but it’s worth it – especially if you head to the nearby Howick Falls too. Nelson Mandela capture site is on the R103. From Durban, take the N3 Highway and then just outside of Howick, take the Tweedie turnoff to Lions River. Turn right onto the R103 and drive for around 5 minutes. There is free parking on the site.